Deny and refuse have negative connotations. At first they seem very similar, but they are not easily interchangeable. Deny usually speaks of dismissing the truth but can also be used to refuse an activity or believe in something. Refuse is used to turn down an offer or negate taking part in an activity. Refuse has a secondary meaning as the garbage that is discarded. What is the meaning of deny? The principle meaning of deny is non-acceptance, to say what is not true. The antonym is to admit, agree to a truth. When someone is in denial they are not accepting the truth. It is possible to deny people of their rights or deny knowing a person or a fact at an inquiry. A way to insist something is untrue. He denied the allegations against him in court. A way to refuse to know about something. She denied knowing the whereabouts of the hidden treasure. Deny has a noun form – denial. What is the meaning of refuse? Refuse is part of a negative statement and used to refuse concrete and abstract situations. Refusing an offer or refusing a gift would be the example of using refuse. Refusing something is to turn something away. The antonym to refuse is accept, and one can accept both the abstract sentiment and a concrete fact. Refuse has a second meaning as the garbage you discard. The man will refuse to work in unhealthy conditions. I refuse to accept the rumors spread about my friend. 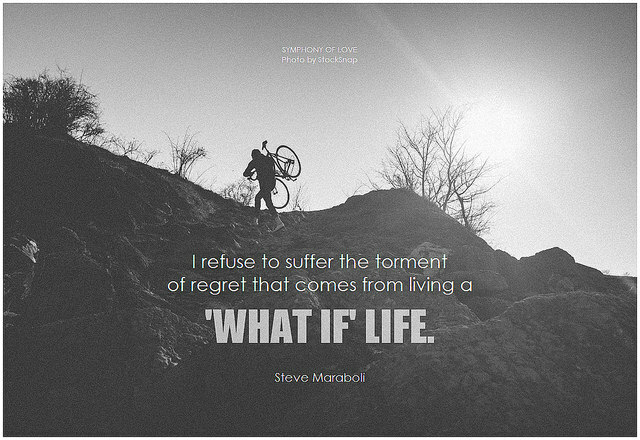 Refuse has a noun form – refusal. Refuse is usually followed by the preposition to. The refuse is collected on Thursday and taken to the dump. These words describe negative responses. Deny, dismisses knowledge of a truth. Refuse turning away from an offer not wanting to participate. In addition, refuse is rubbish. 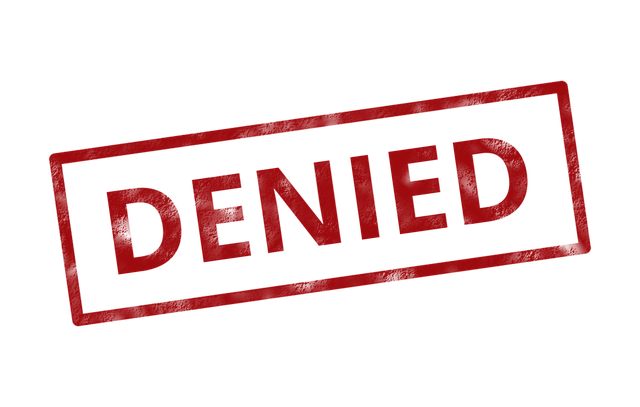 Deny and refuse are both verbs and used to action negative responses to different situations. Their antonyms help with understanding the deeper meaning of the words. Deny – admit is about truth and dismissal while refuse – accept is about dismissing and receiving. “Deny thy father and refuse thy name” wanting Romeo to deny he belongs to the Montague family and refuse to uphold their name. Deny and refuse are easily confused words as they infer a similar concept, a negative response. The reflex from these words is slightly different and one would refuse to… While one would deny that Refusal conjures up a turning away from the action and deny seems to take a stand against a principle or person. Understanding the underlying element to use the words in context helps with the correct choice. Shakespeare helps the reader understand this as he uses the two words in a sentence. Romeo must deny the man, his father and refuse the action of being part of the Montague family. Christina Wither. 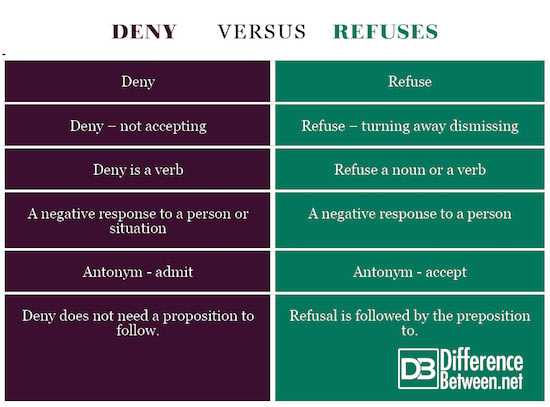 "Difference Between Deny and Refuse." DifferenceBetween.net. July 23, 2018 < http://www.differencebetween.net/language/difference-between-deny-and-refuse/ >.